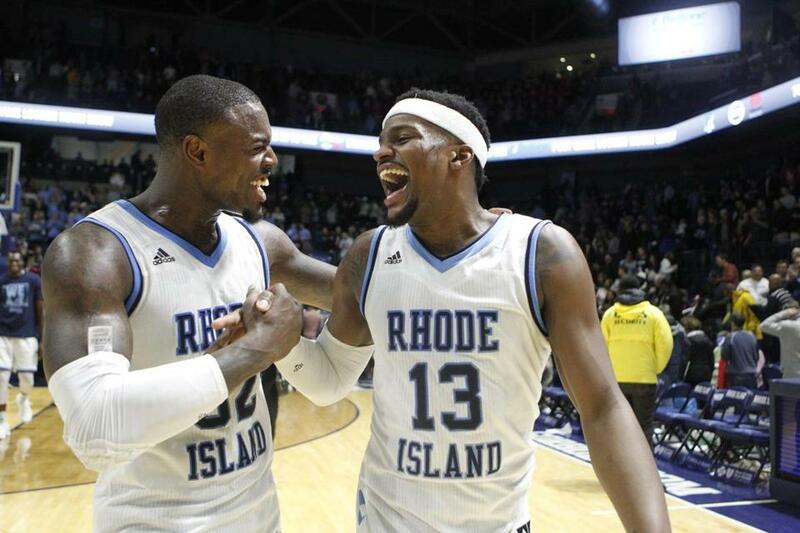 Rhode Island&apos;s Jared Terrell (left) and Stanford Robinson celebrate the 24th-ranked Rams’ 12th straight win. Greg Printz scored 2:11 into overtime and Providence escaped with a 2-1 win over Northeastern on Saturday night at Schneider Arena. The win gave the 10th-ranked Friars (17-8-3, 10-5-3 Hockey East) 3 of 4 points in the home-and-home weekend series against the No. 8 Huskies (15-7-4, 11-5-2) after the teams played to a 4-4 tie on Friday night at Matthews Arena. Matt Filipe put NU ahead 1:43 into the second period, striking for his fifth goal of the season. Kasper Bjorkqvist evened it at 8:05 of the second. BU 4, Arizona State 3 — Dante Fabbro had a goal and an assist and the Terriers (13-11-2) held off the Sun Devils (7-16-5) to sweep the weekend series in Tempe, Ariz.
Brandon Hickey and Fabbro scored in the first to get BU out to a 2-0 lead but Arizona State struck back with a power-play goal at 54 seconds of the second and a shorthanded goal at 7:05 to tie it. Brien Diffley put the Terriers up for good 19 seconds later. Colgate 2, Harvard 0 — Colton Point made 51 saves and Willie Brooks and Bobby McMahon scored power-play goals to help the visiting Raiders blank the Crimson. BC 3, Providence 2 — Katie Burt made 29 saves to set the NCAA record for wins with her 115th and freshman forward Daryl Watts scored with 3:33 left to break a 2-2 tie as the third-ranked Eagles (24-2-3, 17-1-3 Hockey East) completed a home-and-home weekend sweep of the host and 10th-ranked Friars (14-9-6, 10-5-4). With the win, BC clinched the Hockey East regular-season title. Burt, a senior, broke a tie with former Minnesota goalie Noora Raty in getting the record-breaking win. The Lynn native, who played at Buckingham Browne & Nichols, also has 34 shutouts, which ranks fourth all time. Watts, the nation’s leading scorer, also teamed up with Caitrin Lonergan to score goals 2:40 apart early in the second period to put BC up, 2-0. Providence answered in third on goals by Christina Putigna (17 seconds) and Chloe Gonzalves (9:58) to tie it. BU 6, Merrimack 1 — Victoria Bach scored twice to become Boston University’s all-time points leader and the Terriers (10-13-6, 6-10-5 Hockey East) breezed past the visiting Warriors (9-17-3, 4-13-2). Combined with a third-period assist, Bach finished the day with 185 points, 2 better than Sarah Lefort. Her 31st and 32nd goals of the season tied her with Lefort and Jenn Wakefield for most in a season at BU. Harvard 6, Brown 1 — Becca Gilmore and Keely Moy each scored twice as the visiting Crimson (9-11-1, 7-8-1 ECAC) breezed past the Bears (2-21-0, 1-15-0). Vermont 4, Northeastern 3 — Eve-Audrey Picard’s goal with 11.7 seconds left capped a wild third period and got the host Catamounts (8-16-4, 5-11-3 Hockey East) past the Huskies (13-12-3, 9-9-2). Tied 1-1 entering the third, the teams erupted for five goals. Down, 3-2, Codie Cross scored with 2:04 to go to tie it for Northeastern, setting up Picard’s heroics. Drexel 68, Northeastern 67 — Tramaine Isabell scored 21 points and made the winning free throw with a second left to lead the host Dragons (9-14, 3-7 Colonial Athletic) past the Huskies (14-8, 7-3). Northeastern led, 67-61, after Tomas Murphy hit a jumper with 2:20 left, but the Huskies never scored again and missed their last three shots from the field and three free throws. Vasa Pusica missed a 3-point heave at the buzzer. Pusica scored 20 points and Murphy added 16 points. Northeastern saw its four-game winning streak end. Isabell made half his eight attempts from the foul line in the final 1:53. With two seconds left he made the first of two free throws to tie it. He missed the second but grabbed the offensive rebound, Bolden Brace fouled Isabell, and he went back to the line and made one of two to win it. Austin Williams made a layup and Troy Harper added a free throw during Drexel’s late 7-0 run. Williams and Sammy Mojica each scored 13 points and Williams had 11 rebounds for Drexel. Harvard 86, Brown 77 — Seth Towns scored a career-high 30 points, Bryce Aiken was 11 of 12 at the line, and the visiting Crimson (9-10, 4-0) remained undefeated in Ivy League play by knocking off the Bears (9-8, 2-2). Towns made 11 of 19 shots and was 4-for-4 on shooting from behind the 3-point arc. Harvard made 25 baskets in all and was 11 of 18 from 3 (61 percent). Aiken finished with 18 points and was 8 of 8 at the line in the last seven minutes. Desmond Cambridge scored 22 points and Brandon Anderson 19 for Brown. Fordham 82, Massachusetts 69 — Prokop Slanina scored 19 points and grabbed 10 rebounds as the host Rams (7-14, 2-7 Atlantic 10) bounced back from a home-court loss to Rhode Island by knocking off the Minutemen (10-12, 3-6) for the fourth straight time. UMass took a 35-31 lead at the break, but Fordham opened the second half on a 19-5 run. Luwane Pipkins and Carl Pierre scored 18 and 17 points, respectively, to lead the Minutemen. Unique McLean added 14 points and grabbed 12 boards for his first career double-double. The Rams shot 56 percent from the field in the game, including 12 of 25 from distance, and five of their six players scored in double figures to complete their season sweep of the Minutemen. Rhode Island 61, Duquesne 58 — Stanford Robinson hit a 3-point shot as time expired and the No. 24 Rams (17-3, 9-0) beat the visiting Dukes (14-8, 5-4) to extend their winning streak to 12 games overall and 17 against Atlantic 10 opponents. The Dukes led by as many as 15 points in the first half before the Rams gradually chipped away at the deficit behind the play of E.C. Matthews (20 points). A layup by Matthews tied the game at 45 with 6:48 remaining. The game was tied three more times, the last at 58-all on a floater off the glass by Eric Williams with 28.6 seconds left. After a timeout, Rhode Island held the ball for the last shot. Jeff Dowtin passed to Robinson in the left corner and the redshirt senior made only his third 3-pointer of the season. Holy Cross 85, Lafayette 74 — Austin Butler scored a career-high 28 points with five 3-pointers, Jehyve Floyd scored 17, and the host Crusaders (7-14, 4-6) broke open a close game with a 9-0 run in the second half to defeat the Leopards (5-16, 3-7 Patriot). Holy Cross, which has won two in a row and three of its last four, shot 56 percent (33 of 59) from the field, with Floyd a perfect 8-of-8 shooting and Butler was 11 of 15. Karl Charles addeed 12 points with eight assists. Virginia 65, Duke 63 — Kyle Guy scored 17 points and hit two free throws with 6.1 seconds left, and the No. 2 Cavaliers (20-1, 9-0 Atlantic Coast Conference) beat the No. 4 Blue Devils (18-3, 6-3) for their first win at Cameron Indoor Stadium since 1995. Ty Jerome had 13 points and a critical 3-pointer with 37.6 seconds to play, and Devon Hall finished with 14 points to help Virginia win its 12th straight. The nation’s stingiest defense held the top offense in Division 1 to more than 28 points below its average of 91.7 points. Marvin Bagley III had 30 points and 14 rebounds for Duke. Harvard 87, Brown 85 — Taylor Rooks scored 24 points and Katie Benzan added 21 to push the host Crimson (11-6, 3-1 Ivy) past the Bears (13-4, 1-3) for their fourth straight win. Bucknell 67, BU 57 — Katie Nelson and Payton Hauck each scored 14 points but the host Bison (13-8, 7-3 Patriot) hit nearly 50 percent of their shots in handing the Terriers (8-12, 3-7) their fifth straight loss.